In 2010 the Foundation began discussions with the City of Melbourne regarding recognition of John Truscott within the city. This was particularly influenced by the capacity that Truscott brought to Melbourne Festivals, particularly on occasions such as Botanica. 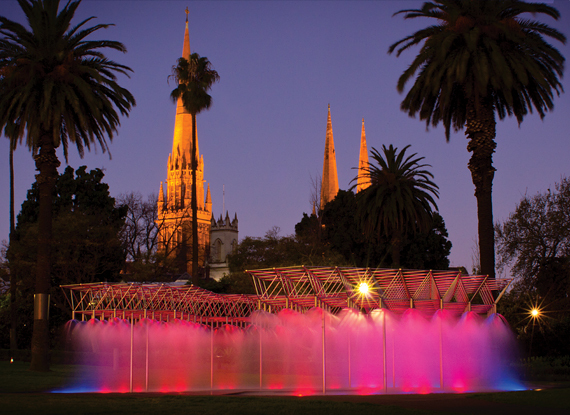 Discussions with the Council led to the opportunity for the Foundation and the Council to provide illumination to the Coles Fountain in the Parliamentary Gardens in Spring Street. The Foundation contributed half the costs of alteration to the Fountain which is now active, adding an wondrous night element to that part of the gardens directly opposite the Princess Theatre.